California officials on Friday recommended $22 million in grants for four microgrid projects, in the first group of awards out of a $44.7 million offering. The first round of funding is designated for microgrid projects at California military bases, ports, and native American tribal facilities (GFO-17-302). Learn more about California microgrid projects at Microgrid 2019. The awards become final upon a vote of the commission. The projects were selected from among 16 proposals submitted in November. Of those, 15 qualified for consideration. The qualified applicants included Ameresco, Consolidated Edison Solutions, Electric Power Research Institute, Grid Alternatives, Handbook Holdings, Pechanga Band of Luiseno Indians, Rincon Band of Luiseño Indians, TRC Engineers, San Manuel Band of Mission Indians, SIA Solutions and the San Diego Unified Port District. The next two rounds of grants, which the commission expects to announce in February, will include microgrid projects being developed for disadvantaged communities or other microgrids that provide “clear and definable added value” to utility customers, according to a notice released by the commission. Launched in August, the state offered the $44.7 million to help microgrid projects achieve commercialization. Individual microgrid grants will range from a minimum of $2 million to a maximum of $7 million. Winners must provide matching funds of 20 to 25 percent. 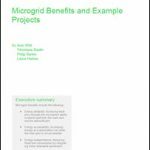 This $44.7 million offering is the second – and largest — major solicitation for microgrid projects issued by the commission. In 2014 the commission offered $26.5 million, which resulted in seven microgrid demonstration projects. California is among a list of states now actively courting microgrids with grant money. Others include Connecticut, Massachusetts, New York and New Jersey. Track the latest news about microgrid projects. Subscribe to the free Microgrid Knowledge newsletter. Why Choose a Clean Energy Microgrid?